Iceland has dive sites that are unlike any others in the world. She is most famous for her fresh water dive sites in the national park of Thingvellir. Called Silfra, you dive in a narrow crack between the American and the European continental shelves in astonishingly clear water. Another dive unique to Iceland is Strytan. This spire marks a hot spring of fresh water at over 70 oC. It is though to be the only one in the world at diveable depth - the top of the pinnacle is at 15 m and it drops down to 70 m.
There is also diving in the Atlantic Ocean. Whichever you choose, the water is cold. The sea temperature is between 7 and 12 oC. February to April is the coldest and August the warmest. Fresh-water sites like Silfra has a constant temperature of 2-4 oC. Where are the Best Dive Sites in Iceland? Thingvellir is a national park. The area is on the tectonic plate boundaries of the Mid-Atlantic Ridge. 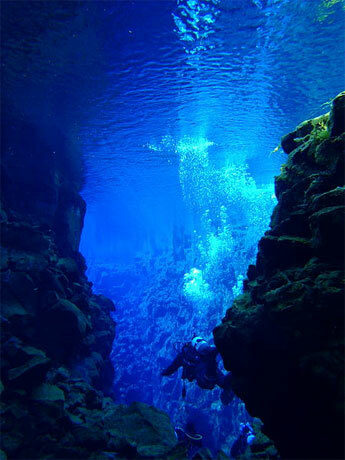 There is amazing crystal-clear diving in the rifts between the European and American plates at Silfra and Daviosgja. Video by Sebastiaan van Aard, who was making his first dive in a dry suit. You can read his blog at My Scubadiving Stories. Silfra is 50 km North East of Reykavik. At 2-4 oC you need a dry suit. "Unique dive spot in the world. You dive in cold freshwater in a crack between the American and the European continental shelves. The water comes from the Glacier and forms a small river and lake. Over 100 metre (300 feet)visibility. Incredible under water caves. Make sure you have an experienced guide that can guide you through the dives. I have dived Yongala in Australia, Zenobia on Cyprus and also the Red Sea. Anyway Thingvellur on Iceland is a unique dive spot beyond comparison that must be on every top 10 diving list! " " Fantastic dive site. Endless visibility in a canyon between the American and European continents. Diving in Iceland is definitely expensive, but so is Iceland. For me personally it was absolutely worth it. The best dives I had so far. I stayed in the guesthouse which belongs to Hotel Keflavik. Nice rooms and good service for budget price. " 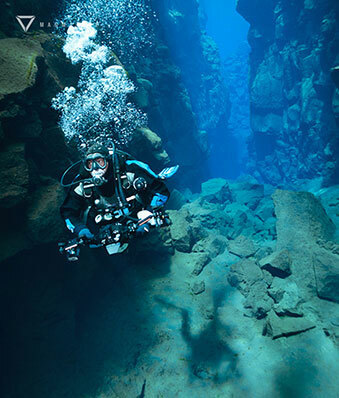 " Diving in +3 C cold water with visibility over 150 m. Silfra is the place where American and European tectonic plates meet, and you can go diving between them! " "Silfra (The name is a variation on the word Silver) is a deep crack in the lava in the National park Thingvellir in Iceland. It is about 5 to 10 meters wide and 200 meters long. Average depth is about 20 meters but there is a dropoff down to 40 meters. Silfra is a large fresh water spring where water from the nearby glacier Langjokull surfaces and runs into the lake Thingvallavatn. Silfra's main attraction is the total clarity of the water. The clarity of the water gives the diver the feeling of flying above the bottom and on sunny days when there are slight small waves on the surface the light breaks into its rainbow of colours creating a beautiful display of colour. The water is very cold, only about 2 degrees Celsius, so frost protected equipment and dry suits are necessary. The lake Thingvallavatn is also interesting with some canyons in the bottom but less visibility. No boat is needed for Silfra the diver simply dresses on shore and jumps of the vertical bank. " "Flosagja and Haagja are also interesting to dive and have clear water. 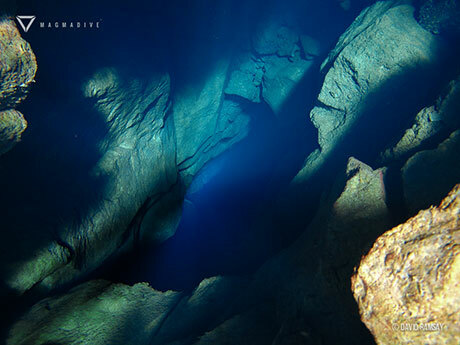 There are caves extending from the cracks under the lake and can by dived by very experienced cave divers. The cracks require advanced dive experience. " "Diving between European and American tectonic plates. " Strytan is in the North of Iceland, over 400 km by road from Reykjavik. It is another dive site unique to Iceland, the only geothermal pinnacle which is at diveable depth. Strytan rises from 65 m to 15 m. Hot freshwater pours out of the top of the pinnacle. This British oil tanker was sunk by the Germans in Seyoisfjörour on the East coast of Iceland. 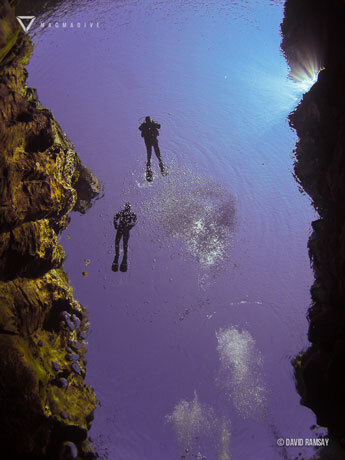 At its deepest it is at 45 m; the bridge is at 27 m.
" Diving Silfra with DIVE.IS was great experience." New Dive service for underwater photographers in Iceland. Run trips to Silfra, Strytan, Kleifarvatn and other Icelandic dive site all year round. Help us expand this section: tell us about a dive operator or list your diving company on this page. Please send us your comments on Iceland. Do you want to recommend a diving centre or dive site? Let us know. If you own a dive centre get yourself added.